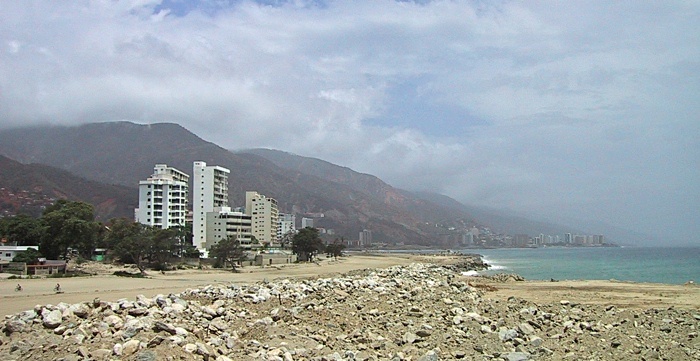 In the middle of December 1999 it started raining in the Cordillera de la Costa mountains to the south of the weekend getaway towns of Los Corales and Caraballeda, which are on the coast north of the city of Caracas. It's estimated that over four meters of rain fell in a couple of days. 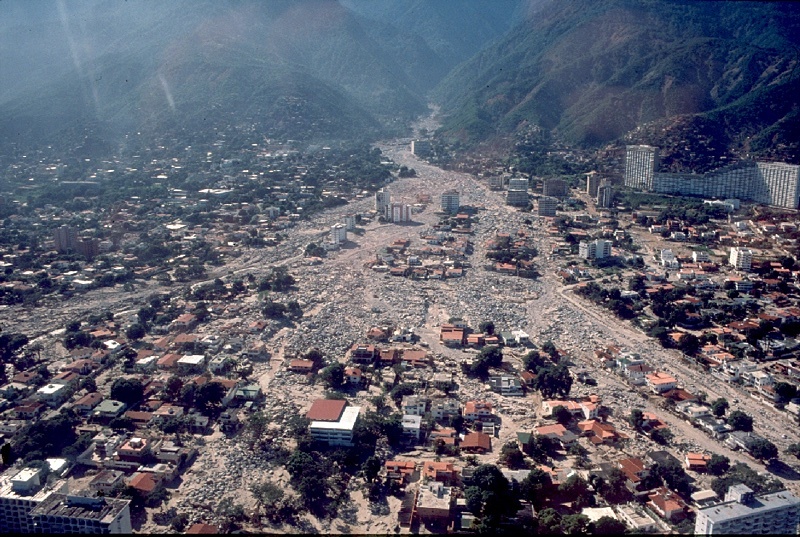 This triggered a series of mud and land slides that claimed the lives of anywhere from 10,000 to 50,000 people in the narrow strip of land between the mountains and the Caribbean Sea. No one knows for sure how many people were killed. 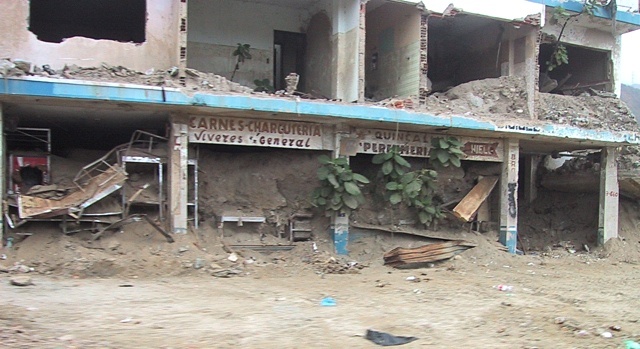 Over 150,000 people were left homeless after the floods in the states of Vargas and Miranda, which make up the coastal region and the Caracas Valley. 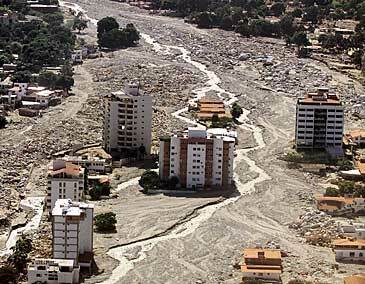 The picture below was taken a few days after the largest of the catastrophes. There were buildings in all of the areas that appear flat in the picture. All of the houses that were in and around the flat areas were buried up to their second stories with mud and debris. In addition to all of the buildings that were destroyed on the ground in the flat areas, there were untold thousands of houses built on the steep sides of the mountains up and down the coast. The poor people have no where else to live, so they construct houses of cement and blocks on any piece of land they can find, and as quickly and cheaply as possible. 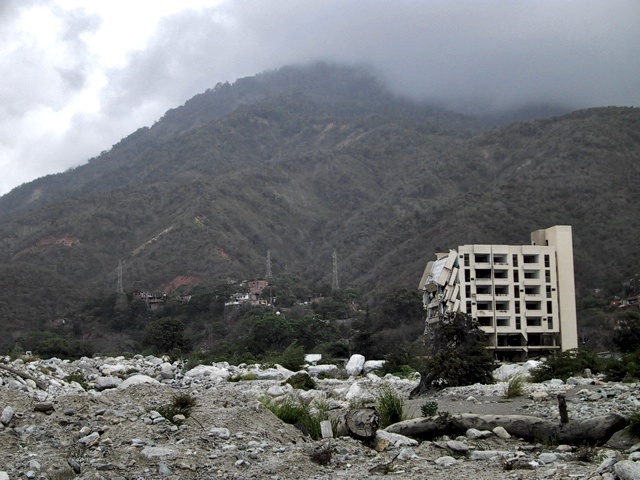 The area of the mountain in the upper right hand corner of the picture, behind the large white apartment building, was probably covered with houses before the slides occurred. Either some of them remain in this picture, or the remains of some of them are still visible near the base of the mountain. 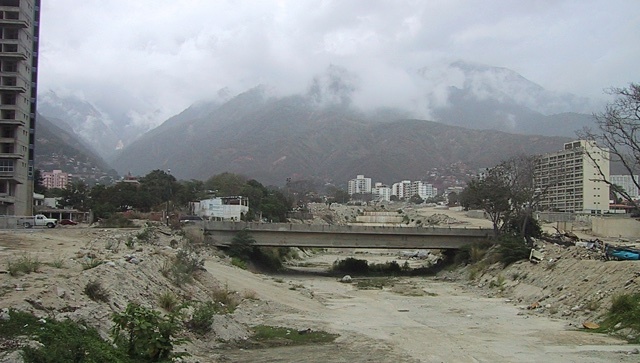 The two pictures below are of the Rio Julian which is the main river coming out of the mountains in the picture above. 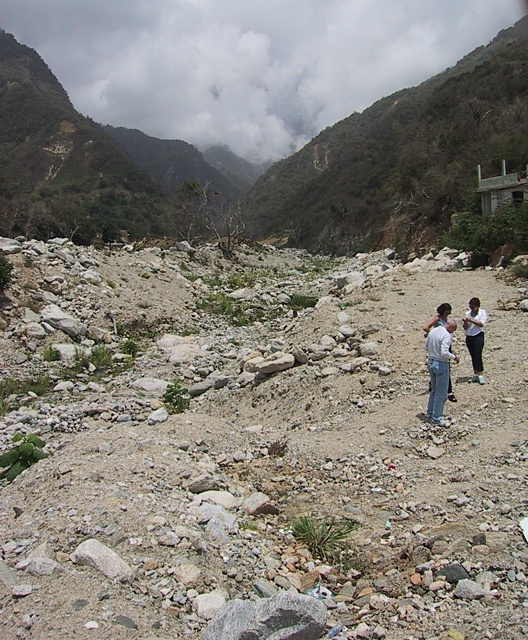 The first picture is a shot of where the debris came down out of the mountains. The second is in the direction of the sea. It's estimated that the wall of water, mud, rocks and large trees came down out of the mountains at a speed of 60 kilometers per hour. The river bed obviously wasn't able to contain everything. Where I'm standing is very near the top of the mud covered area in the picture above. This picture below is a bit misleading. Aside from looking a bit barren the picture makes the place look reasonably normal. This picture was taken a year and a half after the event, and after millions and millions of cubic meters of mud and debris had been removed. Everything in the area of the picture below was probably under five to ten meters of mud after the slide. Just mud would have been one thing, but it wasn't just mud that came flying out of the mountains. The rock in the picture below was about as big as a truck, and there were plenty of them washed downstream in addition to trees up to half a meter in diameter. 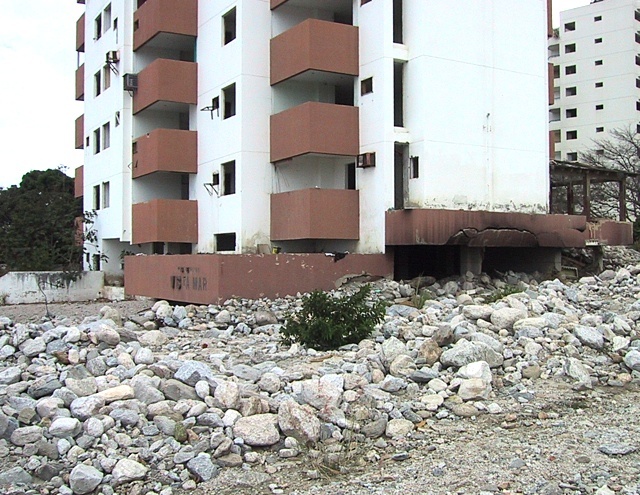 Below is a now abandoned apartment building that was on the edge of the mud flow. I believe it is the smallish white building, to the left of the large white building, that you come to as you follow the right side of the mud flow area down from the mountains in the first picture above. Below is a picture of what was the Vista Mar apartment building. The first floor has been buried. The brown structure on the ground is the roof of the entry. The Vista Mar is the brown and white building just up from the center of the picture at the top of the page. The picture below shows how deep the mud was in this area. This house was a little more than half way between the mountains and the bottom of the aerial picture at the top of this page. All of the missing mud and rock was removed from the area. The buildings below were almost at the beach. The first floor rooms were filled with mud as well as a meter or so of the second floor rooms. Below we can again see how deep the mud was, and how much of it had to be removed. These houses were just south of the coastal highway and again pretty close to the beach. 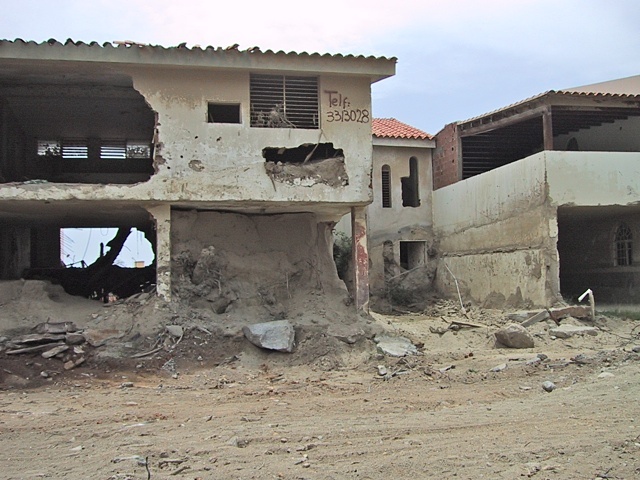 Whole neighborhoods were just wiped off the map only to be replaced by dirt and boulders. Some houses were left, but others were just removed with the rest of the rubble. The physical destruction was one thing, but there was a massive amount of looting that took place in the area for months afterwards. 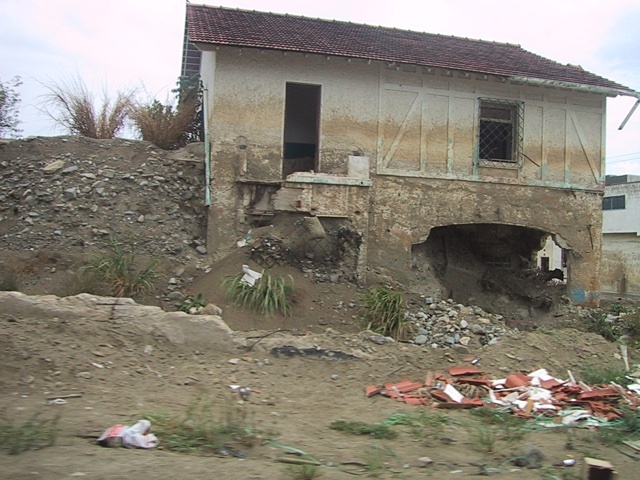 A fair percentage of the houses that could be repaired have been reclaimed by their owners, but many houses have been left just standing vacant, usually full of mud. It's probably because the owners were killed in the floods. What do you do with all of that dirt? 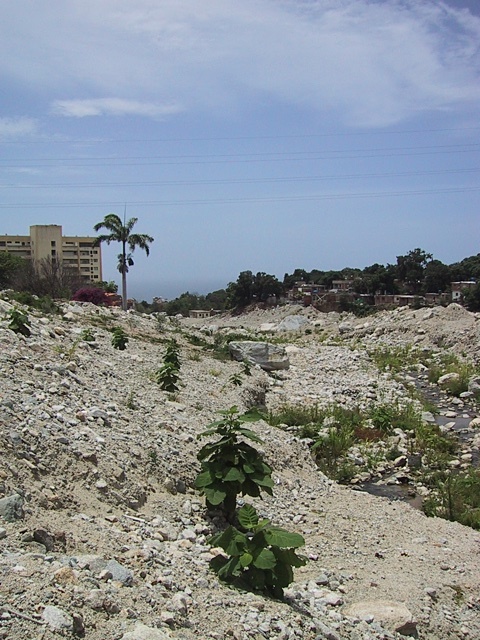 All of the mud and rock that was removed from the inland areas was used to basically create new beach front property. For about three to four kilometers the land was extended out about 100 to 200 meters beyond the end of the beach that existed before the slide, and it wasn't flat, either. 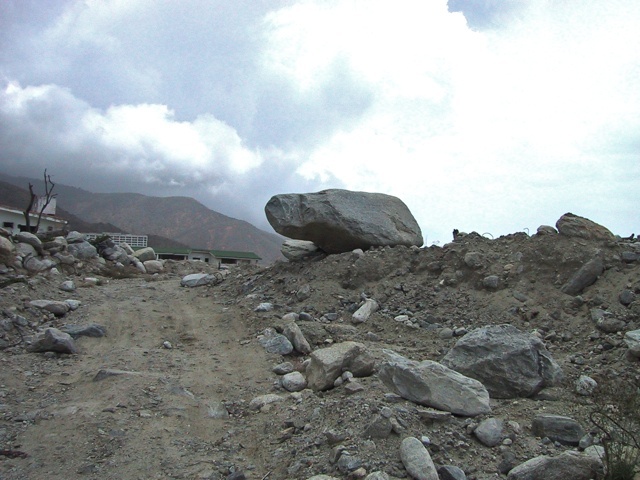 Sometimes the dirt and rocks were piled up to large mesas about ten meters above the sea. Our propose for being here was to survey the positions for a couple of shot points where explosives would be set in holes that were drilled for use during the Caracas Long Profile deployment. One shot point was almost in the sea on the newly created land, and the other was where I was standing when I took the two pictures of the river at the top of the page. 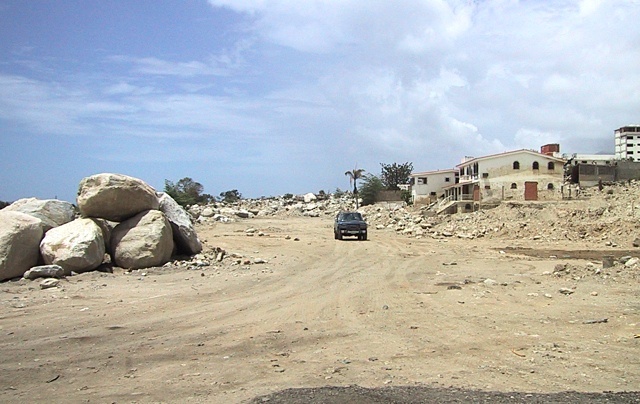 Additional pictures from the Los Corales/Caraballeda and the surrounding area can be seen here . HOW COME WE DON'T HAVE ONE OF THESE?